If you are facing 80071392 error code when trying to sign in to Windows Live Messenger I got an easy solution for you. The 80071392 error is caused due multiple Windows Live Messengers running in the background, even if you don't see them appearing in the taskbar. To fix error, simply run Task Manager by pressing ctrl+alt+del buttons or right mouse click at Taskbar and Start Task Manager. End all processes that contain msnmsgr.exe or anything very similar to this if you are using an older version of Messenger. 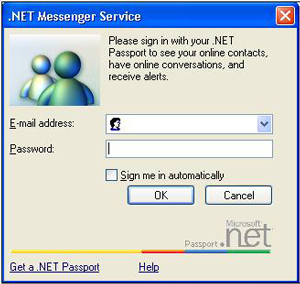 Once you end Msn applications you should be able to run and sign in to Messenger. If for some reason you still can't get ride of this error I recommend you to run top registry fix tool, Registry Easy to fix and speed up your Windows. If none of these method listed above won't work run best registry fix tool. When you are try send a photo or an image to friend using built in file transfer feature your image appears in a photo sharing box. To avoid this from happening simply drag and drop your image to contact's name from your contact list. Now you will be able to transfer your images the way you used to! Ever wanted to change your current MSN password?. You can do this by changing your Microsoft Passport password. You see this error, when trying to sign-in, using Windows Live Messenger 9, or 9 Beta. We noticed it may also happen when you are already logged in. This problem is Beta related, it's nothing wrong with your settings and PC at all. Windows Live Messenger (MSN) allow only one user to launch WLM (MSN Messenger) service by default. However, with some simple tweaks and tips you can get WLM (MSN) running simultaneously. - Select "Allow me to connect to several accounts simultaneously"
We decided to make a step forward! We got many requests lately. It's hard to find solutions for all of these annoying MSN/WLM errors in a very short time. We are seeking for new members who would like to help other people to solve Messenger related problems. Any kind of help appreciated, but after all, it's good for community to share the ideas! Are you having problems with installing Windows Live Messenger (WLM) or MSN Messenger on your PC or Notebook? If you are still unable to get Messenger work, we recommend you to Download best registry cleaner to fix your errors and speed up your computer. From our experience the best registry repair tool is Registry Easy. Are you having problems with receiving or sending files via MSN or Windows Live Messenger? You have chosen to transfer a file which may be unsafe. This file was blocked because this file type can't be shared. Messenger does not allow you to send high virus risk files with an exe;.bat;.com;.cmd;.reg;.vbs;.inf;.msi;.htm;.htm extension. If you want to send any of these file types use WinRar before sending. There are specific ports needed for file transfer, you must open ports 6891 through 6900. Use extension fix I made. Download link - http://addmymsn.com/extensionfix.reg ("save as"). You cannot recieve any message on MSN Messenger or WLM but are able to send messages to other contacts. "The following message could not be delivered to all recipients"
We recommend you to use webmessenger until we figure out how to solve it. Click Start Button, then click Run, type regsvr32 softpub.dll. Restart MSN Messenger or Windows Live Messenger. 2) You may need to MSN Messenger (Windows Live Messenger) to the allowed list of programs in your firewall. 3) Double click on the clock in the Windows taskbar and make sure the system clock is set correctly. When you are trying to sign in Windows Live Messenger you are getting an Error Code 8100030d. The system clock or date may be set incorrectly. The Dynamic Link Library (DLL) softpub.dll, may not be registered on the system. Internet Explorer may be using an invalid proxy server. - Double click on the clock in the taskbar and make sure the system clock is set correctly. - Restart Windows Live Messenger. If you are still unable to fix Windows Live Messenger your computer might be infected or Windows registry corrupted, we recommend you to Download registry tool to fix your errors and speed up your computer. Do you have any other WLM or MSN Messenger Problem? Do you have any other problem (Windows Live Messenger related!) that will make it difficult to care for yourself in a disaster without assistance? If so, let us know. We will try to find solution for you. a.) Leave a comment - including any extra information(Error details, Operating System, Messenger version,..). b.) Send us an e~mail to helpme 'AT' msn-errors.com - including any extra information(Error details, Operating System, Messenger version,..). Do not click on links below. messages every few minutes to all contacts in your Windows Messenger's Contact List. 1) Download best Registry Cleaner to clean out all the mess. Remove MSN Content Plus Register Alert. Your current time trial is expired. Please register or uninstall all products of MSN Content Plus. msnlogs.exe and msnlogm.exe from the Windows folder. The best way to do this is in safe mode and then use the MS-DOS prompt to delete them. Restart your computer (click the Start button on taskbar, choose Shut Down, then select Restart). When the screen appears black and the computer begins to start up, press the F8 key repeatedly (about once a second). A black screen with white text will appear and with start up options. Note: If the Microsoft Windows image with the Windows symbol appears, then you have passed the point to start up in safe mode. Repeat the steps to restart your computer and try again. Depending on the version of Windows you are running, the system may ask you to select an operating system. Chose the operating system you wish to troubleshoot (most will have just one option, Windows XP Professional, for example). The system will continue the start up process. If your computer is password protected, you will be required to log in. You must log in with an account that has administrator access. A message box will appear and ask if you would like to proceed working in safe mode. Click Yes to continue. To verify that you are in safe mode, look at the corners of the main desktop screen. The words Safe Mode should be in the corners of the desktop. Shut down Windows Live Messenger. Then right click the MSN Messenger folders, choose Delete, and then confirm the operation. Do not download any type of MSN Freezer! In most cases it's a virus. "MSN Passport Account Freezer and (De)Freezer [basically just stops freezing]. It gives you the ability to prevent a person from signing into MSN Messenger, or his/her hotmail inbox. It includes support for the latest MSN Messenger Protocol." Do you actually believe in these things? • In the DCOM permissions, the default authentication level is set to None, and the default Impersonation level is set to Anonymous. • The system account does not have Full permissions on a folder or registry key that the Windows Installer is trying to access. This is NTFS-specific. 1. Click Start, click Run, type MSIEXEC /UNREGISTER, and then click OK. Even if you do this correctly, it may look like nothing occurs. 2. Click Start, click Run, type MSIEXEC /REGSERVER, and then click OK. Even if you do this correctly, it may look like nothing occurs, or you may briefly see an hourglass. After you run this command, the operation is complete. 3. Try your Windows Installer-based application again. 1. Click Start, click Run, type dcomcnfg, and then click OK.
a. In the Default Authentication Level list, click Connect. b. In the Default Impersonation Level list, click Identify, and then click OK.
3. Click Start, click Run, type explorer /select, %windir%\system32\msisip.dll, and then click OK.
4. Rename the Msisip.dll file as Msisip.old. 5. Reinstall Windows 2000 Service Pack 3. 1. Start Windows Explorer, right-click the computer's root hard drive, and then click Properties. 2. Click the Security tab, and then click Add. 3. In the Select Users, Computers, or Groups dialog box, click the SYSTEM account, click Add, and then click OK.
4. Under Allow, click to select the Full Control check box, and then click OK.
5. Click the TEMP folder and then verify that the SYSTEM account has full control. 1. Click Start, click Run, then type Regedt32. b. For Windows XP, on the Edit menu, click Permissions. 3. Verify that the SYSTEM account has been added and that it has Full control. If it does not, add the SYSTEM account with Full control. 1. Start the computer by using Windows 2000. 3. Restart the computer (you must do this). 4. Run Instmsiw.exe for installer 2.0 again; this corrects the broken security key for the MSI service. You are unable to sign in Windows Live Messenger. You are unable to sign in. If you are using a ‘NETGEAR Wirelss Router’ you will need to enter tthe ‘Netgear’ router set-up settings page, via internet Explorer. 1.Enter IP address 192.168.0.1 on the address bar. 2.Log on via your user name and password of your ISP. Please download, install and then run the Windows Installer CleanUp Utility and click on the line(s) that show MSN Messenger(s) and then select the Remove button as pictured below. Before trying to re-install MSN Messenger open up IE and then go to Tools -> Internet Options -> General -> Delete Files -> select Delete All offline Content and then select OK and then OK.
You should now have a completely removed MSN Messenger program, a cleared out Internet cache and a new download of the MSN Messenger program on your desktop. It's important to have followed the steps above in the proper order as outlined. Now install the new Messenger by clicking on the icon and following the on-screen prompts and then re-start and re-try to see if the issue is gone. If the issue persists then please visit Windows Update and ensure that all updates are installed for your operating system. If you find some that were not installed please install them and then re-start your computer and re-check for MSN Messenger functionality. If your contact list is empty or incomplete after you upgrade to Windows Live Messenger, the cached contact list may not have updated correctly. Before you can delete your Contacts cache folder, make sure you can view your complete folder list in Windows Explorer. 1. On the taskbar, right-click Start, and then select Explore. 2. Click on Tools, and then select Folder Options. 3. In the Folder Options window, click the View tab. 4. In the Advanced Settings list, select Show hidden files and folders, make sure Hide extensions for known file types is not selected, and then click OK.
5. In the Windows Explorer window, click View, select Explorer Bar, and then verify that Folders is checked. 2. In the folder list on the left-hand pane, navigate to the folder C:\Documents and Settings\Your Windows logon name\Contacts\Your Messenger email address. 3. Delete all of the files within the folder Your Messenger email address. 4. In the folder list on the left-hand pane, navigate to the folder C:\Documents and Settings\Your Windows logon name\Local Settings\Application Data\Microsoft\Windows Live Contacts\Your Messenger email address. 5. In the Your Messenger email address folder, delete the real and shadow folders. 6. Close Windows Explorer and try to sign in to Messenger again. 1. On the Tools menu, click Audio and Video setup. 2. Follow the instructions in the wizard. 3. When you reach the end of the wizard, click Finish. 2. Follow the instructions in the wizard. Use the slider to adjust the volume of your microphone. 2. Select the Optimize my experience for a low-bandwidth broadband connection check box, and then click OK.
* If you are using USB 1.1, you may experience poor quality when you use both audio and video at the same time. You will receive the best quality audio and video when you connect your USB device directly to your computer. * We recommend that you make computer-to-phone calls only over a broadband connection. * If you are downloading large files or running other programs during your call, the quality of the call may deteriorate. Close other programs and file downloads to conserve bandwidth. * Windows Live Call network performance can also affect the quality of your call. To check the status of the network, go to the Windows Live Call Network Status website. 1. Go to the MSN Web Messenger website and sign in. If you can sign in to MSN Web Messenger, but Windows Live Messenger still can't access the Internet, Windows Live Messenger may be blocked by a firewall. 2. Make sure your antivirus or antispyware programs don't conflict with Messenger. * On the taskbar, click Start, and then click Run. * Type cmd, and then click OK.
* At the command prompt, type ipconfig/flushdns, and then press ENTER. 1. If you use a dial-up connection and the connection is timing out, try to sign in again later. 2. If your computer is part of a corporate network, contact your network administrator to make sure that the network allows access to the Messenger service. 1. In the notification area on the taskbar (near the clock), click the Messenger icon, and then click Exit. To share song information with your contacts, you need to set up Windows Live Messenger and Windows Media Player to work together. 2. In the left pane, click Personal. 3. Under My Display Name, select the Show song information from Windows Media Player as a personal message check box. 4. In the left pane, click Background. 5. In the right pane, select Windows Live Messenger Music Plug-in. * This feature is compatible only with Microsoft Windows 2000 or later. * This feature is compatible only with Windows Media Player 9 or later. MSN Messenger Not Responding when you Sign in? 1) Uninstall MSN Messenger Live in the Add/Remove Programs Panel in Control Panel. 2) Delete the MSN Messenger Live folder in Documents & Settings, and App Data. 3) Reinstall MSNM, and disable all options. 4) Disconnect from the internet, via Run/cmd (the command prompt). By going C:, ipconfig all, ipconfig release. 5) Start up MSN , and wait for a troubleshoot screen, press 'repair' and let it do what it does. 6) Reconnect to the network. 7) Sign in again and configure options (except sign in automatically, and sign in when connection to inernet establsihed). 1) Exit MSN Live completely (this means right clicking the Messenger tray icon and choosing Exit). 3) Once there, you must remove the following subkeys:for Messenger 8.0: Policiesfor Messenger 8.1: Shared4. Close your registry editor and restart Messenger. Where do I find the plug-in for Windows Media Player that lets me show contacts what music I'm listening to on Windows Live Messenger? Open Windows Media Player. In Tools menu you'll see Plug-ins. Check Windows Live messenger Music Plug-in. And in Live Messenger, under your status you have and a down arrow. Click the arrow and select Turn On "What I'm listening too"
2) Under the "Now Playing" tab, click "more Options"
3) In the "Plug-ins" tab there will be a category list box. In that list box click Background. To the right of it should be the "windows Live Messenger Music Plug-in" Make sure that is checked. When trying to add a new contact to your list MSN Messenger tells you that your contact list is full. MSN Messenger currently has a limit of 150 contacts. If you have 150 contacts in your list there is simply no way to add more new contacts. This amount might be increased in the future. In march it was increased from 100 to 150. If you have an amount of contacts that is below the maximum amount and yet, you are not able to add a new one, this is most likely a server side issue that may show up after adding and deleting contacts for some time. Usually, this problem fixes itself after some time. When you really need over 150 contacts or are not able to add new contacts the only thing you can do for now is to create one or more extra MSN Messenger accounts. Using a so called "polygamy patch" or a client like Trillian you can be signed in with more then one account at the same time. Pick your Account Example Guest or the account you log with. Then click on Manage my network passwords under the Related Task Block. Then hieghlight the email you want to remove. The "Sign me in automatically" checkbox is missing and you have to retype your username and password each time to get online in MSN Messenger. This is probably caused by a security setting which does not permit storing passwords on your computer. If you have sufficient rights (you are an administrator) on your computer you can reset this setting by running this file. First, try the following: click start, then on run. Type: regsvr32 softpub.dll and press enter. If MSN Messenger does not work yet after this, you can try closing Messenger then go to www.passport.net with Internet Explorer (also if you normally use another FireFox) then click on the sign in button, you may get a certificate dialog. Accept the certificate, now if you start MSN Messenger it should work. If you did not get the certificate dialog and MSN Messenger still does not work, open the advanced settings dialog in Internet Explorer by clicking on the Tools - Internet options menu and then go to the advanced tab. Go down to the security section and make sure use SSL 2.0 and use SSL 3.0 are both checked. This has been notified - do not panic, it is not just you. This problem has been happening for a few days to many people. Msn is aware (see their homepage) and are fixing the problem. Should be fixed within the week. Use webmessenger until we figure out how to solve it. Update: It seems the service is returning to normal. I would suggest signing out and back in again if you are still receiving the error. Apparently engineers investigated the problem and found a fix. If none of these methods listed above won't work, we recommend you to run registry fix tool. Msn-9.0plus.exe -- It's A Virus! Hej, did you download the new MSN yet? lol check out MSN Plus...it ownz! dude, this is awesome... a must see! lol I just updated my Messenger and I must say IT ROCKS! Go to command prompt and type in the following OR go to Start -> Run and then copy and paste each line below hitting after each one. What these statements do is re-register the cryptographic files for Windows XP. Usually blown encryption is an effect caused by a virus or SpyWare infection. On the General tab, if the On check box is selected, the Windows Firewall is enabled. If this option is not selected, then ignore the rest of the steps below. Under Programs and Services, select MSN Messenger if it appears in the list, and then click Delete. Click Add Program, click Browse, and then locate the C:\Program Files\MSN Messenger folder. Double-click the Msnmsgr file. Note: The computer settings determine whether the file name is followed by the extension ".exe." After you done this, you should be able to sign in the MSN Messenger! If you are still unable to fix Messenger, we recommend you to Download registry repair to fix your errors and speed up your computer. From our experience the best registry cleaner is Registry Easy. When you are trying to sign in Windows Live Messenger you are getting an Error Code 80072efd ;"Sorry, we were unable to sign you in to the .NET Messenger Service at this time. Please try again later. 80072efd"
Check the .NET Messenger Service Status. In Internet Explorer, click Tools and then click Internet Options. In the Internet Options dialog box, go to the Connections tab. Untick the Use a proxy server for your LAN (These settings will not apply to dial-up or VPN connections) checkbox. If you are still unable to fix Messenger, we recommend you to Download registry repair tool to fix your errors and speed up your computer. Error code 80048820 is a common one with MSN Messenger 7.5 and Windows Live Messenger. When you start MSN Messenger, you are unable to sign in. Fix 80048820 MSN (Windows Live Messenger) Error. -The system clock may be set incorrectly. -The Dynamic Link Library (DLL) softpub.dll may not be registered on the system. -Internet Explorer may be using an invalid proxy server. -Double click on the clock in the taskbar and make sure the system clock is set correctly. # Restart MSN Messenger (WLM). Remove any Internet Explorer proxy server settings. 4. Untick the Use a proxy server for your LAN (These settings will not apply to dial-up or VPN connections) checkbox. 5. Click OK and OK again Internet Options.